The PNA Series is the highest-performing microwave network analyzer in the industry for passive and active device test. You can choose from five frequency models, 13.5 (N5221A), 26.5 (N5222A), 43.5 (N5224A), 50 (N5225A), or 67 GHz (N5227A), and customize your PNA with just the right level of performance to meet your specific budget and measurement needs. 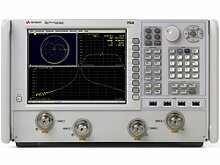 The Keysight PNA is used to test a wide variety of passive and active devices such as filters, duplexers, amplifiers and frequency converters. The high-performance characteristics of the PNA make it an ideal solution for these types of component characterizations as well as millimeter-wave, signal integrity and materials measurements. The PNA Series provides high-power sources and the best linear receivers, giving it the most accurate S-parameter measurements with the widest power range in the market.